Forum selection is a particularly important part of a contract when the parties are from different jurisdictions, especially when the laws of those jurisdictions differ significantly from one another. A forum selection provision gives a business the security of knowing that any litigation will take place in a familiar location applying a familiar set of substantive laws. However, a poorly worded forum selection provision may not provide the security hoped for as a recent opinion from Delaware’s Chancery Court in a partnership dispute case demonstrates. The case, In re Bay Hills Emerging Partners I, L.P., et al, involved the issue of whether a forum selection provision in a limited partnership agreement required all lawsuits to be filed exclusively in Kentucky. The defendant in Bay Hills was the Kentucky Retirement System, the official administrator of Kentucky’s retirement system. It was the sole limited partner in four Delaware-based limited partnerships. The limited partnership agreements the defendant entered in all four limited partnerships allowed it to remove general partners “for cause.” The defendant exercised this right and served a removal notice on the general partners of all four limited partnerships. The four general partners responded by filing suit in the Delaware Chancery Court in April 2018, seeking to block the removal. The defendant moved to dismiss the case, arguing in part that the forum selection clause in all four partnership agreements required any lawsuit to be filed in Kentucky. The forum selection clause at issue provided that “each of the Partners hereby consents to the jurisdiction of the courts of the Commonwealth of Kentucky and further consents that venue shall lie in the Franklin Circuit Court located in Franklin County, Kentucky.” The Chancery Court rejected the defendant’s argument that this provision required all litigation to be conducted in Kentucky. The provision, the court explained, was primarily a consent to jurisdiction in Kentucky. The forum selection, however, was permissive, not mandatory, as evidenced by its use of the word “consents” and its failure to clearly state that the Franklin County Circuit Court was the exclusive forum for the resolution of disputes. To drive home its point, the Chancery Court compared the forum selection provision in the limited partnership agreements to similar provisions in other agreements that had been found to be mandatory, which provided that “any” or “all” actions brought by the parties “shall” be brought in the specified forum. The Delaware Chancery Court is far from alone in refusing to interpret consent to jurisdiction in one forum as a requirement that all litigation must take place in that forum. Finding an experienced business litigation attorney can help to prevent filing a lawsuit in the wrong forum when a mandatory forum selection provision exists. Similarly, a skilled business litigation attorney may also be able to prevent a company from litigating a complex business dispute in an undesirable forum by arguing that the forum selection provision is not mandatory but permissive. Super Lawyers named Illinois commercial law trial attorney, Peter Lubin, a Super Lawyer and Illinois business dispute attorney, Patrick Austermuehle, a Rising Star in the Categories of Class Action, Business Litigation, and Consumer Rights Litigation. 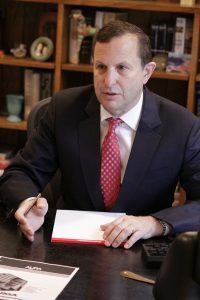 Lubin Austermuehle’s Illinois business trial lawyers have over thirty years of experience in litigating complex class action, copyright, non-compete agreement, trademark and libel suits, consumer rights and many different types of business and commercial litigation disputes. Our Flossmoor and Wheaton business dispute, civil litigation lawyers and copyright attorneys handle emergency business lawsuits involving copyrights, trademarks, injunctions, and TROS, covenant not to compete, franchise, distributor and dealer wrongful termination and trade secret lawsuits and many different kinds of business disputes involving shareholders, partnerships, closely held businesses and employee breaches of fiduciary duty. We also assist Chicago and Oak Brook area businesses and business owners who are victims of fraud. You can contact us by calling (630) 333-0333 or our toll-free number (833) 306-4933. You can also contact us online here.